The material used to make Fluorinated Spill Pallets is exactly the Polyethylene used for Ultra-Spill Pallets. This provides excellent support for heavy loads and better accessibility for pouring and transporting the contained liquid. Spill Pallets are treated with a process known as fluorination. This makes them compatible with more corrosive chemicals and certain chlorinated solvents. The polyethylene construction provides superior chemical compatibility whereas the fluorination process provides additional protection against chlorinated solvents or any other corrosive chemicals. 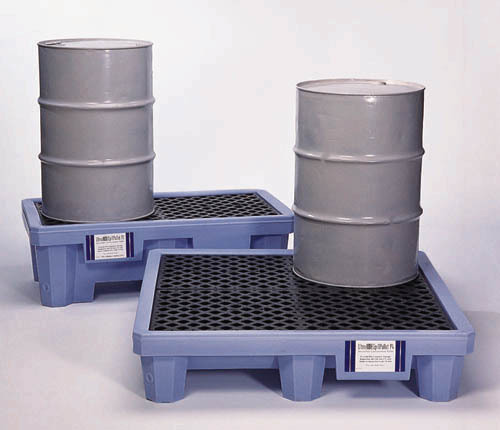 Some chlorinated solvents are incompatible with polyethylene spill pallets. The fluorination process modifies the surface of molded polyethylene products. This makes them compatible with such corrosive chemicals. The light blue color signifies that the Spill Pallets and grates are fluorinated.The fluorination process modifies the material on a molecular level in order to allow for a higher level of chemical compatibility.